There are apples galore in the fields and at the markets these days! It’s a great time to stock up on your favorite varieties and turn them into tasty applesauce for the winter. We threw some cranberries in our batch for color and taste. 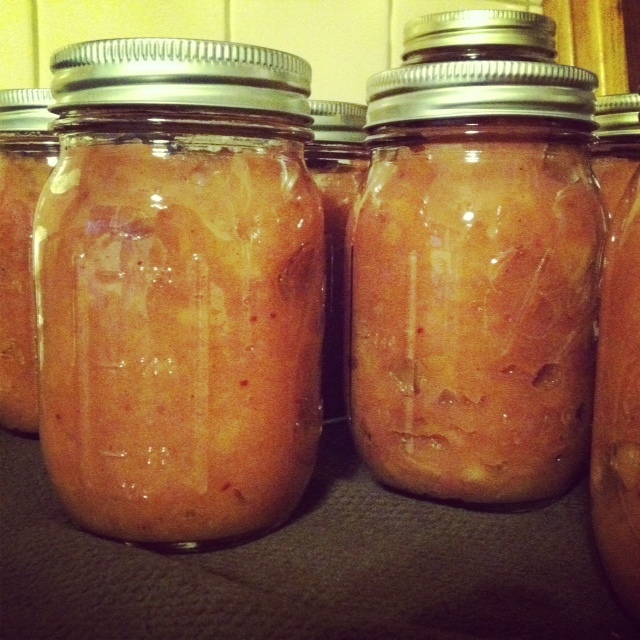 For the best canning advice (sans your grandmother), I always use: http://www.pickyourown.org/applesauce.htm. They are an excellent resource for step-by-step canning instructions. If you are new to canning, I recommend that you go there for a complete list of utensils and guidance. Wash and chop apples (leave the skin on). Put an inch of water in a large pot and fill the pot with the apples and cranberries (the apples mostly cook in their own juice, so there is no need to add a lot of water). Put the lid on the pot and cook apples on high, until they begin to sizzle and cook, then turn the heat down to medium high. Cook the apples until they are soft. At this point, Lucky and I just mashed the apples with a potato masher, rather that using a sieve to turn it in to “real” applesauce. We like ours sorta chunky – but I recommend sieving the apples if small children will be eating the applesauce. My 2 year old niece didn’t care too much for the chunky apples! If you choose to keep your applesauce chunky, add cinnamon at this point, mash the apples and cranberries, stir, and begin the canning process. If you like the smoother variety, check out the instructions on the link above to sieve the apples and then follow canning instructions to complete. Then, enjoy the taste of Fall, all through the Winter!